ORANGE LINING is a two phase public art project created by Buster Simpson and Peg Butler, for TriMet’s new Portland – Milwaukie Light Rail (PMLR) Transit Project. The two phases complement each other with alignment-wide art installations that create conceptual and aesthetic continuity along the 7.3 mile length of the new light rail alignment. The installations are episodic expressions of the times, reflecting upon the egalitarian, utilitarian and civic nature of this new infrastructure project. In spring of 2012, we drew upon Portland’s ethic of civic engagement and creativity by putting out a public call for short lines of text (fifty characters or less) to be incorporated onto the temporary Art Starts Now, and the permanent Impressed Concrete installations. We received 1100 submissions and selected 102 of them for use in the project. Phase one of Orange Lining, Art Starts Now, employs orange silt fencing as a surface for publishing the poetic works solicited from the public, assigning a dual function to this utilitarian material. Phase two, Impressed Concrete enlists the process of stamping street names into concrete to place the selected lines along the alignment where new sidewalks are installed. The intention of both projects is to work with common construction materials and the skilled tradespeople responsible for building the light rail alignment. A view of Orange Lining looking toward McLoughlin Blvd. 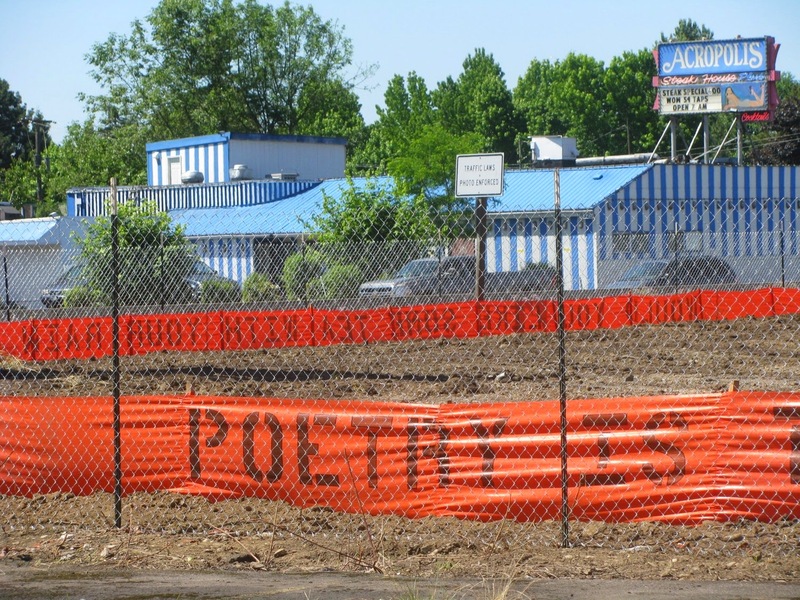 For Art Starts Now installations, orange silt fencing, typically used at construction sites to control soil erosion, doubles as a surface for publishing lines of texts along the alignment. The lines will generally be printed onto the silt fencing before it is installed, construction workers will then install it where needed along the construction project. The process is a chance sharing of the role of curator and installer between artist and the construction worker. During the Impressed Concrete phase, lines are “set in stone. They are being stamped into freshly laid concrete sidewalks by the same masons who are building the streets and walkways along the alignment. Borrowing the utilitarian process of stamping street names in concrete, an act of civic hospitality commonly found throughout the neighborhoods, this project marks expressions of a specific time in history and acknowledges the public benefit of this substantial infrastructure project. The first stamping while still wet. Located on SW Lincoln near SW 5th. Documentation is taking place during both Orange Lining phases. Photographs are capturing the ephemeral Art Starts Now and the permanent markings of Impressed Concrete. The resulting book will be a vestige of the temporary process and a guide to the permanent, linking the transitory to the concrete and visually bringing the projects together as a whole. The book is a physical anthology of the project, a keepsake, a gift to local libraries, and a thank you to the writers who contributed to the weaving of this transit story. A selection group including Buster Simpson, Peg Butler and volunteer literary professionals; David Abel, David Oates and Lisa Radon reviewed and selected writings in a blind juried process. The PMLR Public Art Advisory Committee reviewed the final selections. Orange Lining works on multiple levels – visual, conceptual and poetic. It offers a creative, collaborative adventure that enables an ephemeral yet utilitarian process to evolve and transform into a permanent element of transit infrastructure. The process is legible and transparent to allow for the serendipity that creates an authentic, well-loved urban streetscape. It engages and informs the public, the artist, and the laborer, becoming a visible legacy to be recalled over time as people travel to and from the light rail stations. 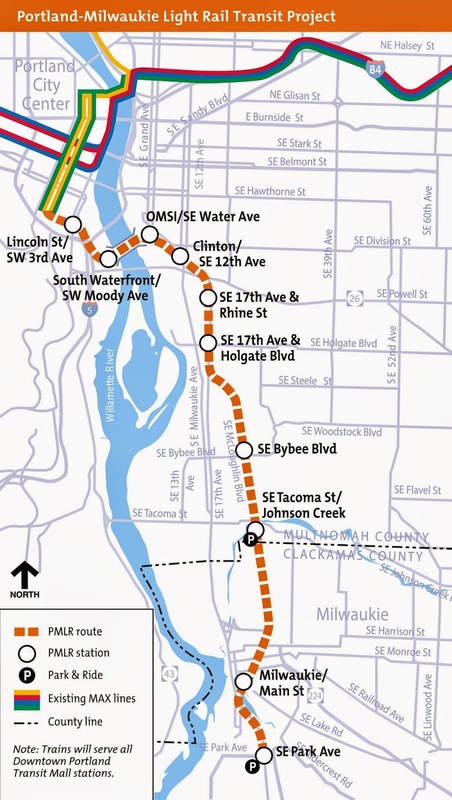 For more information about the Portland – Milwaukie Light Rail Transit Project click here. This website and blog have been created and are updated by Peg Butler. Most of the photographs have been taken by Peg.